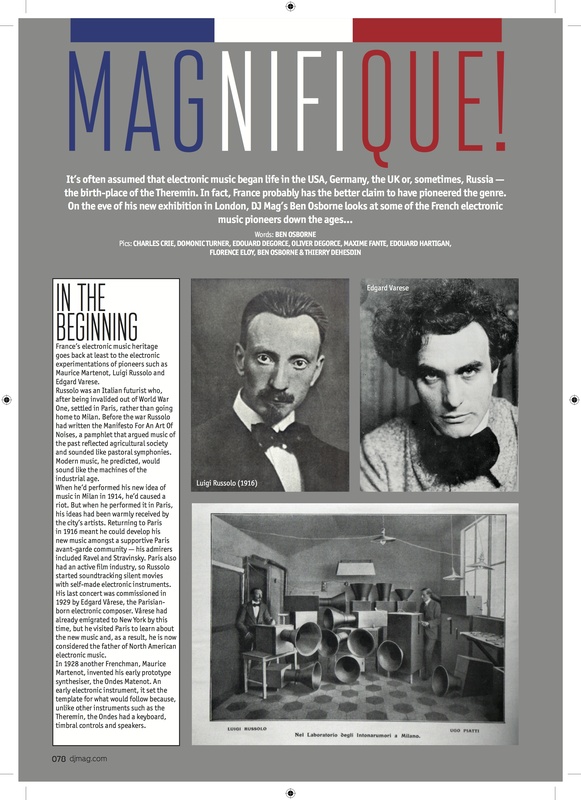 Noise of Art launches French Touch Exhibition and a month of UK events from 3 March – 8 April. This spring Noise of Art launches a touring exhibition on the history of French electronic music, the French Touch Takeover at Kamio and a series of nights celebrating 50 years since psychedelia introduced electronic music into the mainstream. From 16 March to 9 April Noise of Art and Red Gallery/ Kamio, are teaming-up to present French Touch – the first exhibition of photographs, film and artwork documenting the story of French electronic music from the start of the 20th century to the present day. 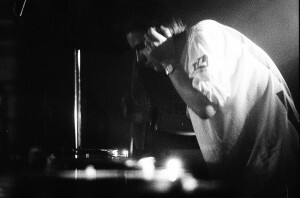 The exhibition will be accompanied by French Touch Take Over in Kamio – a series of music events featuring rare UK appearances by some of France’s electronic pioneers, including Jack de Marseille (pictured in 1995), Jean-Jacques Birgé and DJ Yellow. The month will also feature a new compilation of rare electronic French music on Lo Recordings. Meanwhile, on 22 March, Noise of Art is teaming up with Convergence Festival and Bluedot festival to put on an event celebrating 50 years since the first electronic music event in London. 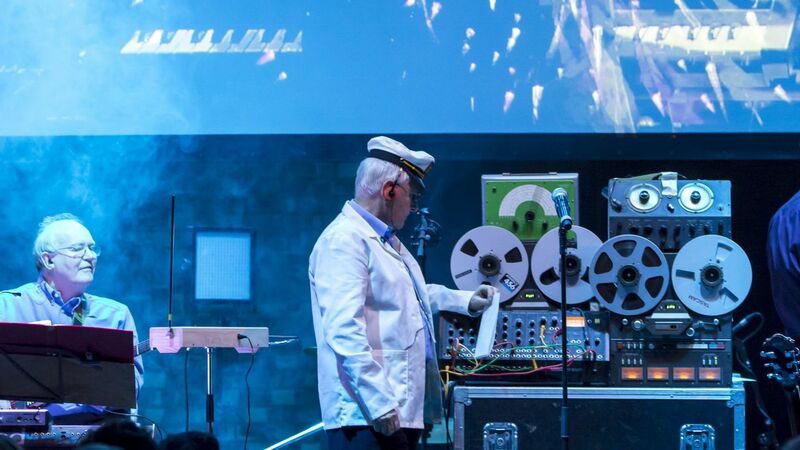 The event takes place at the Jazz Café in Camden and features electronic pioneers Radiophonic Workshop, White Noise, Andrew Weatherall and DJ Ben Osborne performing with Orka. Additional events are taking place at National Portrait Gallery, Red Gallery, Big Chill Bar, Kamio, Jazz Café, The Lockside, The Hog and a not-so-secret pre-event gig at The Crown in Woodbridge, Suffolk. French Touch – an exhibition of French electronic music from the early 20th Century until today. Kamio Bar/ Red Gallery, 1-3 Rivington Street, London EC2A 3DT. 7pm – 1am. Film: Paris/ Berlin – 20 Years of techno. 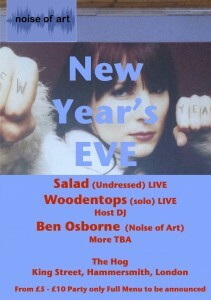 Big Chill Bar, Dray Walk (off Brick Lane), London, E1 6QL Free Entry. 6pm-1am. Slipped Disco, the long running Big Chill club night, returns with a French theme as resident Noise of Art man DJ Ben Osborne is joined by Kitsune mainstay DJ Jerry Bouthier, aka JBAG, the man behind BoomBox, Ponystep and many others. 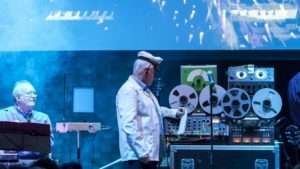 To start its celebrations of 50 years since electronic music and psychedelia colided, Noise of Art’s invited the legendary electronic pioneers, Radiophonic Workshop, to headline a special show at Convergence Festival in conjunction with Bluedot festival. Following Noise of Art’s event at Convergence Festival, Ben Osborne and guests throw a shin dig at Noise of Art / Red Gallery’s exhibition celebrating French electronic music. The Lockside, 75, Upper Walkway, Camden lock, London NW1 8AF. Veteran DJ Justin Robertson joins Ben Osborne continue the celebration of UK and French electronic music. A rare UK gig from French hip hop and house pioneer DJ Yellow – resident at Paris’ first hip hop club, Chez Roger Boîte Funk, and the man who launched the career of Bob Sinclar – amongst others. The Hog, 272 King Street, Hammersmith, London W6 9JT. Ben Osborne’s funk, disco, balearic house and soul socials featured all manner of live guests in the West london garden with a pub. Former resident at Paris’ mega clubs, such as The Queen And Red Light , DJ Paulette,will revisiting her residency at the hacienda’s Flesh night, with a set of French disco. Ygal has been a long standing fixture on the Parisian scene as the right hand man at the helm of the Versatile Record label and is now part of the fast rising cool as F, Antinote imprint collective. Launch party got the Lo Recordings compilation accompanying the exhibiton. Savaggio comprise of three techno DJs who are also classically trained violinists and flautists. Their sets see them swap between the decs and classical instruments. The exhibition’s not closing for a few more days, but any excuse for a party, right? Also celebrating the history of French disco and the WeWantSounds Disco.2 compilation. Private View (open to public) Thursday 16 March. Events on 16,17, 18, 22, 23, 25, 29, 30, 31 March 6 April and more dates and venues to be announced. Noise of Art and Red Gallery/ Kamio in Shoreditch, are teaming-up to present the first exhibition of photographs, film and artwork documenting the story of French electronic music from the start of the 20th century to the present day. Curated by Noise of Art’s Ben Osborne and Red Gallery, the exhibition will run from 16 March – 9 April and will be accompanied by a launch party on 17 March featuring legendary French DJ jack de Marseille, followed by a series of event in several venues running from 17 March to 8 April. 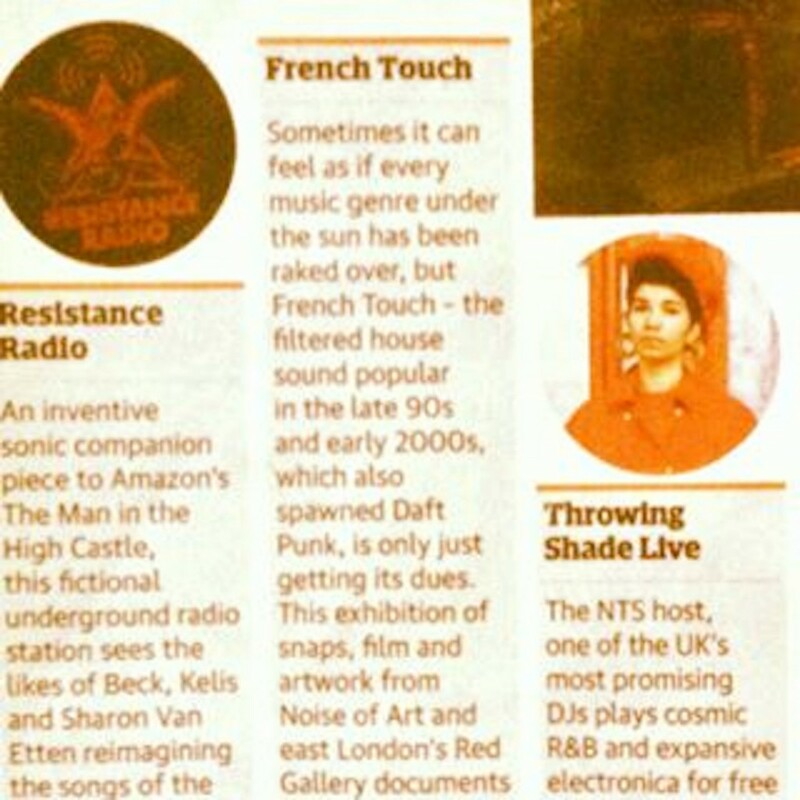 French Touch features contributions from members of the public, as well as DJs, artists, photographers and key figures in the story of French electronic music – including Laurent Garnier, Jack de Marseille, Black Devil Disco Club, I:Cube, Gilb’r, Antinote Records, Jayhem (Kojak), Chateau Perché, Pierre Henry, Jean-Jaques Perrey, Jean Jacques Birgé , Jean Michel Jarre, DJ Paulette, Isabel Guilet, Lo Recordings and more. Professional photographers contributing include Olivier Degorce, Edouard Hartigan, Domonic Turner and Jean-Luc Bouchart,. Documenting the culture that surrounds the music scene, and the moments captured on camera that wouldn’t have happened without it, the exhibition also features some of the characters that shaped the lifestyle associated with music and clubbing. Free entry to entertainment for NYE dinners with a special NYE menu from the Hog’s renown kitchen. Thursday 8 December, 2016. St Martin’s Place London WC2H 0HE. DJ Ben Osborne plays a set inspired by the portraits at Central London’s iconic art gallery. spinning an electronic set spanning everything from classic techno, punk-funk, galactic house, to deep down and dirty disco. 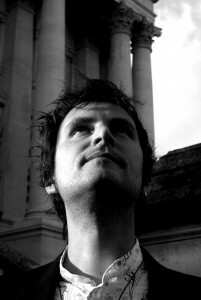 Ben Osborne is the founder of Noise of Art and is a DJ, musician, writer and broadcaster. He tours internationally at club nights and festivals and has worked at the forefront of digital music, and written extensively about music for newspapers and magazines, including for DJ Mag, Music Week, The Guardian, and i-D. He has published a biography of the Arctic Monkeys and his book on the development of electronic music and club culture has been described as ‘essential’ by Gilles Peterson. 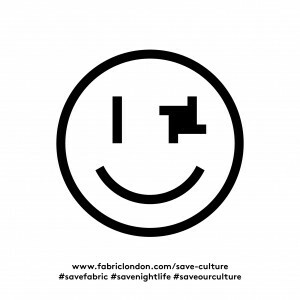 Noise of Art is delighted that the flagship London club Fabric is going to re-open. Earlier this month Noise of Art joined a panel of speakers at The Museum of London to discuss the implications of the club’s threatened closure on the future of club and music culture in London. The event was part of a night organised by Andrew Rutland and Martin Green. The panel was put together and moderated by Alan D Miller, Chairman of The Night Time Industries Association. Speakers included presenter and journalist Sunta Templeton, Andy Blackett (Head of Events and Promotions, Fabric), Henry Scott Irvine (Activist for Save Tin Pan Alley), journalist Kate Spicer and Noise of Art’s Ben Osborne. It was a good and far-ranging discussion, highlighting throughout that we need to protect the capital’s vibrant culture in all its forms. Fabric staying open is fabulous news. A viable and internationally recognised cultural venue has been saved. Congratulations everyone. Ben Osborne is a DJ, musician, writer and broadcaster and is the founder of Noise of Art and the long running Slipped Disco Club. From, 14:00 hrs in the park followed by events at Pump and Grind, 1 Great Colman St, Ipswich IP4 2AA and The Music Room until the early hours. Rodrigezz & MDL (Poland), The Normans, Peter Hepworth, Richard Haugh, Josh Lock, Blue Kubricks, David Freeland, Mole, Deben Collective, Aartwork and more. 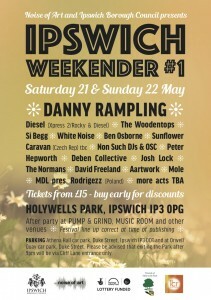 Noise of Art is teaming up with Ipswich Borough Council to launch a series of annual Music and Art festival weekends in the beautiful surroundings of Holywells Park. Headlining the first event will be Danny Rampling, the internationally renown DJ who kick-started the acid house explosion in London with his seminal nightclub Shoom. 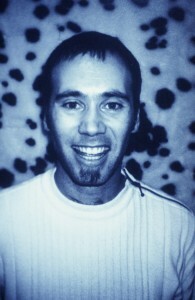 As a leading light of the original Balearic and acid house scene, Danny was amongst a clutch of DJs that recognised the unique cross over potential of the Woodentops, the first band to be respected by both the dance and indie guitar scenes. The Woodentops headlined Glastonbury and paved the way for bands such as the Happy Mondays and Primal Scream. Despite this shared history, this will be the first time Danny Rampling and the Woodentops have appeared on the same bill. Diesel, half of Skint signed act Xpress 2 and former member of the Ballistic Brothers, has been responsible for underground classics on labels such as Junior Boys Own, as well as chart topping hits, such as Lazy – featuring Talking Heads singer David Byrne. White Noise were responsible for the UK’s first electronic LP, An Electric Storm. Their members also helped introduce electronic music to such late Sixties icons as Paul McCartney, John Lennon and David Bowie via their shows at Arts Lab, while their members were also behind the seminal early electronic theme tune for Dr Who. Amongst the other acts announced in the first wave are several rising local acts. The Normans are a new Suffolk based afrobeat /acid jazz band, Peter Hepworth is a bubbling under singer songwriter, Aartwerk combine traditional sea-folk music with cutting edge electronica, The Deben Collective play unique, improvised electronic jazz funk, Richard Haugh hosts BBC Introducing in Suffolk, David Freeland is a respected rare groove DJ, and Non Such DJs are Ipswich’s foremost Soul DJ tag team. As well as curating the event, London and Suffolk based Noise fort founder, Ben Osborne will be DJing, playing a trademark eclectic set that Time Out magazine has described as encompassing everything from ‘shimmering electronic delights” to “dance floor bombs”. The event will also host techno DJ Rodrigezz jetting in from Poland. The event is being programmed by Noise of Art, which in the past has worked with such leading institutions and festivals as Latitude, Tate Britain, the Southbank Centre (Royal Festival Hall), Big Chill Festival, The Great Escape, Convergence Festival, National Portrait Gallery and British Film Institute, as well as international acts such as Coldcut, Laurent Garnier, Booka Shade, Groove Armada, The Beatles , Andrew Weatherall, Phil Hartnoll (Orbital), Andy Barlow (Lamb) and many more. 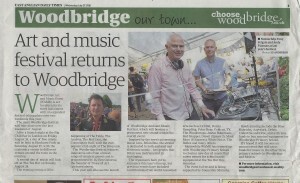 Noise of Art also launched Woodbridge Art and Music Event in Suffolk. The event takes place in Holywell’s Park and Pump and Grind. Holywells Park is a natural site for the festival. It received a grant of £2.8 million in 2012 from the Heritage Lottery Fund and Big Lottery Fund, to restore the Park’s heritage and improve its facilities to attract a wider audience to the Park.